Investment in building and infrastructure is booming, yet on average large-scale projects run more than 20 months behind schedule. According to research by the McKinsey Global Institute, an astonishing 98% of large-scale schemes around the world run 80% over budget and almost two years behind schedule. Poor communication, a lack of skilled workers and a failure to adapt to modern technologies are all acting as a drag on productivity. Thankfully the industry could now be on the cusp of radical improvements in performance. Digital technologies, such as on-board telematics, have been improving the way construction site managers access and analyze machine data, and how many construction companies are catching on to the fact that drones can also play a role in monitoring progress and spotting delays before they happen. the most superior drones on the market offer 3D mapping and land surveying, with a flight time of 30 minutes and a 7 km control range. While analysts believe the drone industry will top $5 billion in the next two years, it’s still early days with only one in 10 construction companies currently using this new technology. Among the early adopters bucking the trend is John Bird, Managing Director of Yarrows Aggregates. 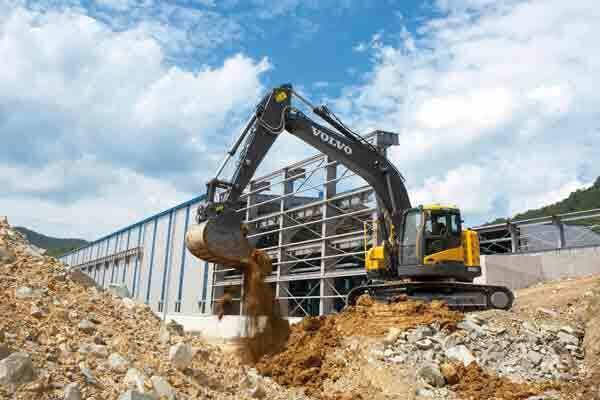 He was one of the first in the UK to start using Volvo Construction Equipment’s On-Board Weighing system and has recently set up drone technology to assess his 125-acre site. Every month, a drone flies over a pre-determined route and automatically captures measurements of volume, pile count and tonnage within just a few hours. He said: “I’m always willing to invest in new ways to work more efficiently and drone technology like this allows me to access data far more quickly and accurately than I would ever be able to gather manually. We move a lot of material, so it’s vital I see an up to date record of what’s currently available so that I can plan and respond before we run out of any product. When you couple this with technology like On-Board Weighing we can ensure our machines are working to their optimum capacity. Construction start-ups are quick to recognize this growth in new technologies. Automation firm Doxel has developed a system where robots visually monitor every aspect of labor productivity and then use algorithms to relay progress in terms of timings, budgets and project’s targets. The company says it can increase productivity by 38%, but whether humans will welcome this robotic advice is open to question. New techniques are now available that promise to make the most out of construction workers’ individual behaviors and routines. In the UK, the academic Dr. Laura Florez has devised a productivity-busting algorithm that works out where best to place workers on site dependent on their personalities and skillsets. The academic’s system means that even with a diverse and ever-changing workforce on site, the time-consuming task of manually monitoring staff and site dynamics can be worked out more speedily. Better training and increased investment will also provide a productivity boost. The UK government has recently pledged to invest an extra £64 million into digital and construction skills. But even if training is given a boost, how can companies keep workers from leaving for more lucrative job roles? According to the ADP Research Institute, construction wages increased by just 2.3% across the industry in the USA last year, well below the national average. This is due in part to the fact that any increase in wages will eat into a project’s already stretched financials. Whether automation, government policies or improved workforce dynamics will be the answer to construction’s productivity issues remains to be seen. What is known is that these methods can go a long way in reducing lengthy delays.